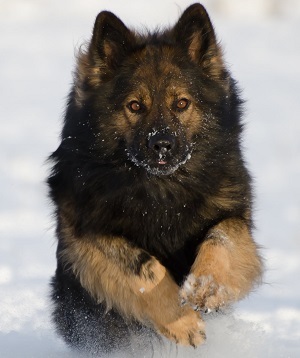 Nanaimo RCMP service dog Jager helped track down a suspect wanted Island wide. Photo courtesy of Nanaimo RCMP. NANAIMO, B.C. – Sarah Marleau has had outstanding warrants, but she was finally taken down by a police dog. Nanaimo RCMP responded to a call at around 2 a.m. on January 29th. According to a release from the detachment, a resident reported seeing three people with flashlights near a parked vehicle. Officers located the black Honda Acura, which had been reported as stolen four days prior. The suspects were not in the area, but an officer and police service dog Jager tracked a woman hiding in the nearby bushes. The woman refused to cooperate with the officer and after an altercation with Jager, she was taken into police custody. Marleau has had warrants originating from Campbell River, Courtenay and North Cowichan. The warrants were for assault with a weapon, theft under $5000, three counts of fraud, four counts of possession of stolen property, and breach of an undertaking. She is set to appear in court on Thursday, January 31st in Courtenay.